My real estate purchase experience with 1ST Choice Realty and Chad was a very positive one. 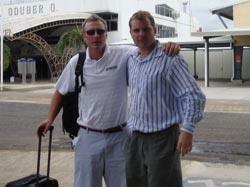 We had been in constant contact prior to my arrival in Costa Rica to search for properties. He was knowledgeable of the area, the buying process and had helpful points to guide me with my decision. Throughout the purchasing process he was readily available to answer questions I had, and always responded in a timely manner. We have remained in communication after my purchase, which I appreciate. He has continued to help me with resources, tips, and recommendations for getting ready to build my home. 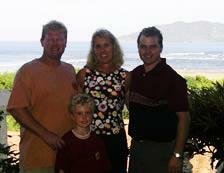 I would recommend Chad to anyone looking for a property in the Tamarindo and surrounding area. My husband and I have been going to Costa Rica since 2007 we fell in love with nature and beaches and decided to invest on a property. Thanks to Ronald & Chad we found our dream lot in Playa Grande, they are very profesional, knowledgeable and respond to all our needs during the process. We also feel like they treat us like good friends. Very happy and excited !! 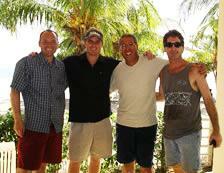 We recommend Chad and Ronald from 1st Choice Realty to anyone who's going to purchase some Real Estate in Costa Rica. Thank you both for making possible our dream !!! In early 2016 my wife and I decided that it was time to get serious about pursuing our dreams of owning real estate in the Tropics. We had already concluded that Costa Rica (and most specifically the province of Guanacaste) was our location of choice. We spent countless hours looking through various websites and at one point we inquired about a few properties we saw on the 1st Choice Real Estate website. The very next day Chad Fisher stepped into our lives. From day 1 Chad and his team have been very professional, kind, and knowledgeable about the Real Estate process, the requirements, and quirks etc of buying property in Costa Rica. Chad helped make the entire process as seemless as possible – and in our week in Costa Rica (Sept 2016) we landed on purchasing an amazing lot for our future dream home! We cannot imagine having gone through this process with anyone other than Chad and team. (On a previous trip to Costa Rica in 2015 we had met a real estate agent from a competitor company down the road, and after a few weeks of back and fourth emails, we were essentially blown off)…I can honestly say that Chad Fisher has been with us every step of the way – and to this day, continues to follow up and shows genuine interest in our soon to be “building” process! 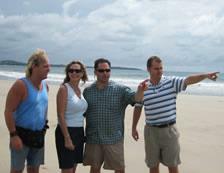 We would recommend Chad Fisher to anyone interested in purchasing Real Estate in Costa Rica 10/10! Chad, keep up the fantastic work, and we look forward to our next steps along the way of building our dream! We recently purchased our dream lot through Chad Fisher at 1st Choice realty. Mr.Fisher was extremely helpful, professional and attentive to our needs throughout the entire process. We are Costa Rican residents and had a big wish list including ocean views, a respect to nature and off course something we could afford. 1st Choice was on top of all the real estate in the area. Mr. Fisher and his team were excellent in helping us with the closing process and made buying land on Costa Ricas beautiful gold coast a dream come true. I purchased a business in Tamarindo and he actually talked me out of the two more expensive businesses that I was interested in and pointed me in the direction of the less expensive one. I was surprised by that kind of behavior from someone who makes his living on commission, but he genuinely wanted me to get the right property for me. As it turns out, his local knowledge of the town proved invaluable. His assessment was right on and I got the better of the 3 businesses, as well as the least expensive. The most pressing issue for me was that I was living in the states at the time all of this was happening. He arranged to have people check on the equipment at the business, took pictures of the questionable issues and had them all resolved BEFORE any money changed hands. He was my eyes and ears when it came time to do all of the paper work, find a lawyer, and perform the due diligence.I highly recommend 1st Choice. In fact, since I've been here in Tamarindo, I've sent him two clients...both of which had transactions and experiences similar to mine. Flawless. 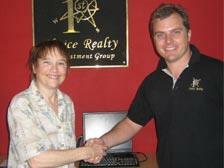 1st Choice Realty made our buying experience in Costa Rica seamless from thousands of miles away. they were always very prompt in returning phone calls, emails, answering questions, and coordinating paperwork with the sellers agent, title company, attorneys, etc. 1st Choice Realty steered us clear of properties that they felt were unsuitable or were of subpar construction and only offered us high quality properties that he would purchase. Even after the sale 1st Choice Realty has reached out to us via email and Skype to check on our experience thus far and we greatly appreciate his service and new friendship. I highly recommend 1st Choice Realty for your real estate purchases in Costa Rica, they are on your side and will work diligently to find you a great property and a fair market price. You are a great realtor! You are amazing with your enthusiasm. I have never had a realtor be so helpful. Because of this, I will let you be my realtor and I am going to give you my sister's email address. She is flying down to Costa Rica in June. I want you to email her and also send her a copy of this email I have sent you. Tell her that i think you are the best I have ever seen. You will surely be able to make a great sell from her. She is going to buy sooner than I am, so it is to your advantage to contact her immediately. My hubby and I are 90% sure we will be buying something there, but it will be several months before we can come down. There's no need for you to take your precious time and visit that condo to take more pics. Just have that owner email pics of the baths and closets. Again, thank you so much for all the attention you have given me and I look forward to working with you. Keep the pics coming! Thanks for the update. I appreciate the time and effort on your behalf and wish to thank you for your thoroughness in this matter. In our business, its important to recognize professionalism in our peers. Your time invested in this matter will not be forgotten. 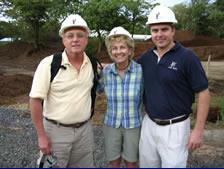 "Dan has proven himself to be a knowledgeable and valuable partner in our ventures here in Costa Rica. He has an extensive working knowledge of the market and best practices in the real estate realm in Costa Rica. Prompt and courteous and always a pleasure to work with. We consider him to be an invaluable asset." I feel like I need to let you know about Derrick's assistance during my time there. He was extremely helpful in locating and gaining access on short notice to properties that I randomly showed interest in. He was always on his game, not too agressive, but very interested in helping me in everyway to help make my decision easier and with more knowledge. I really enjoyed working with him and when it does look like I am ready to actually purchase property, I will definitely be contacting him. 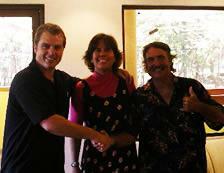 We had the great fortune to have Dan as our realtor when we decided to purchase a condo in Tamarindo. Not only was he very professional, but also very personable. Dan displayed tremendous patience and helpfulness throughout the time we spent viewing listings, making the overall experience pleasurable. He very diligently guided us through the process of buying in Costa Rica, while sharing his knowledge and experience of the area. Dan also set us up with an excellent lawyer for the paperwork, and made sure we understood the intricacies of Costa Rican real estate laws. I can't recommend Dan highly enough, we not only bought a condo on that trip but also made a friend in Dan. Looking forward to seeing you next spring when we are down. Take care and enjoy! Daniel Talbot is the most professional realtor i have ever encountered. His dedication to finding the right property for his clients is endless. His knowledge of the area and home values is outstanding. His negotiation skills will always obtain his clients the best value for their money. His professionalism does not end at the closing of your property. Dan is always there to help you and make the transition to your new home and answer the many questions you will have being new to the area. His network of referrals is of tremendous value. I sold my Tamarindo condo and bought a newer, bigger, beach-closer condo through First Choice Realty, with two closings in about 30 days, and all with the same money. I've done about 25 property purchases and sales, in my life, and I've never had anyone perform as excellently and caringly as First Choice Realty. I worked with Derrick and Chad, who literally took care of everything. Their advice was consistently sound all the way through. Their efforts were effective and conserved my time, energy, and money. "It was great to have someone that knows Costa Rica's laws, land and people. Your group, especially, Chad and Grettel, added a personal touch that few real estate professionals know how to do. Besides finding us our dream piece of property, we feel we have also found new friends in Costa Rica. 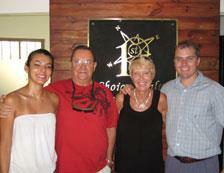 You have made us feel at ease with the process and intricate procedures of buying real estate in Costa Rica." "Carol and I have been extremely happy with the work of everyone at 1st Choice Realty. They responded quickly and professionally to all of our questions by e-mail while we were still in the States. When we arrived to Costa Rica Grettel did a wonderful job showing us the areas and lots that we were looking for that were in our price range. She was patient and very knowledgeable to the area, offering insight and information that we would never have thought of. Grettel and everyone at 1st Choice Realty made purchasing property in a foreign country a much less stressful experience than it could have been. As a resident of the area, I now realize how lucky we were in finding 1st Choice Realty. They are, and will continue to be, the first company we think of and recommend to anyone coming down to visit looking for either investment property or a place to live." "I am happy to see that Grettel and Chad’s diligence has resulted in gathering the requirements to close on Lot 24 in Pacific Heights. I had thought it would be yet another day so this was a pleasant surprise. Yes, the process was slow, but thanks to you, it was far less painful than it could have been. Through the ups and downs, you have been conscientious and professional in every detail. I truly appreciate your efforts and know that you will be successful in the future with your clients. Appreciation again for a job well done!" In the fall of 2005, I had the good fortune of being referred to Chad Fisher of 1st Choice Realty in Tamarindo for helping me identify and purchase a special piece of Costa Rican property. It was Chad's familiarity with the region and his long standing relationships with those involved in it's land development that allowed me to purchase a wonderful property in the beach community of Avellanas that was not being marketed at the time. Chad demonstrated he will make the extra effort. Dan Talbot made it possible for me to buy my dream home in Tamarindo. It was his none stop help that made it happen. Three years later he is still there for me if i have a problem. He is a good trustworthy man, and has never let me down. Michael Mcmanus. Ottawa Ontario Canada. Daniel has been invaluable. In terms of his business practice he is attentive, thoughtful, tireless , timely and ethical. His extensive market knowledge and skill resulted in our getting the best deal possible...the right deal and the right location. Subsequent to our purchase he has continued to assist us by connecting us with his legal and banking associates as well as familiarizing us with the local resources. Everything has been top notch. We do not know what we would have done without him. Bill and Nora Barker, Calgary Alberta Canada. The service and personal attention we received from Daniel at First Choice Realty was exceptional and unexpected right from the start! His expertise showed by asking the right questions by phone or through emails helping us to narrow our search before we arrived in Costa Rica. Upon our arrival he was organized and considerate when providing us with an itinerary of the houses we would view each day leaving us time to enjoy the beach and the activities offered in Tamarindo. After patiently going through all the listings and explaining the property details with us, he made sure we got the best value on our final choice. His knowledge of the local market and the surrounding contacts in the community helped us not only make an informed decision but also complete our deal with confidence in the short time we were in Costa Rica. Daniel is someone we can rely on and continues to help us by communicating the progress of the renovations of our home. Regardless of whether you are buying or selling, I would highly recommend Daniel to help you find your dream house. We could not have asked for a better Realtor to guide us through each step of what could have been a very stressful process. Sincerely, Diane and Mike Kuhn Vancouver, British Columbia Canada. Thank you so much for your warm hospitality, your time and a wonderful time you showed us in Costa Rica. We feel nothing less than having some good people like yourself helping us out with the real estate. My wife Lana fell in love with both you and Chad and your name came up several times ever since we got back to US. I can assure you that we would definitely do something soon and will go through you since we really liked you guys and I personally enjoyed your company and Chad as well. Have a great day and please give my regards to Chad and will talk to you soon. I wanted to write a short note, thanking you for all your help and guidance, showing me various properties in Costa Rica. My objective was to get a feel for the availability and pricing for upper end real estate in Tamarindo, Hacienda Pinilla, Reserva Conchal, Playa Flamingo, Playa Langosta, and other private communities in that area. You showed me many exceptional homes and lots, but never wasted my time in any way. I am extremely impressed with your knowledge of the real estate market, and your ability to navigate the Costa Rican roads, many of which I am sure are not on any map. Thanks again for being a true professional. The service and personal attention we received from Daniel at First Choice Realty was exceptional and unexpected right from the start! His expertise showed by asking the right questions by phone or through emails helping us to narrow our search before we arrived in Costa Rica. Upon our arrival he was organized and considerate when providing us with an itinerary of the houses we would view each day leaving us time to enjoy the beach and the activities offered in Tamarindo. After patiently going through all the listings and explaining the property details with us, he made sure we got the best value on our final choice. His knowledge of the local market and the surrounding contacts in the community helped us not only make an informed decision but also complete our deal with confidence in the short time we were in Costa Rica. Daniel is someone we can rely on and continues to help us by communicating the progress of the renovations of our home. Regardless of whether you are buying or selling, I would highly recommend Daniel to help you find your dream house. We could not have asked for a better Realtor to guide us through each step of what could have been a very stressful process. I have to say that your organization is truly first class. Your service and consistent contact is tremendous. Vianney was extremely thorough in his pursuit in identifying our needs and available inventory. Should our needs arise again in the future, yours will be the first contact we make. "I did a lot of research prior to buying land in Costa Rica, and that involved contacting MANY agencies and agents, surfing countless websites, etc. What I found was that most agents really didn’t care to talk to me (much less email me back), unless I was standing in their doorway with cash in hand. Chad, however, answered all my questions & kept up contact via email and occasional phone calls. It’s a big decision to spend a large sum of money in a foreign country, but they walked me through the whole process and made me feel comfortable. I have to say I felt that everyone at 1st Choice was very professional, and honest (not just trying to “hard sell” something - the place kinda sells itself). So here I am now, a happy man, with a little piece of paradise to call my own, thanks guys." For various reasons I wanted to sell my property before years end 2009. Your name was recommended to me from my good friend living in Tamarindo. I am very pleased with the way you have processed this transaction, our communication and your way of managing all necessary pieces leading to closing. Most of all I am impressed that you managed to find a buyer with such a short notice, also given the time of the year and the current economic climate. For me as a seller, living in Sweden, with practicalities as time difference and not speaking Spanish your job has been invaluable. As you understand I will be glad to recommend you to other clients. 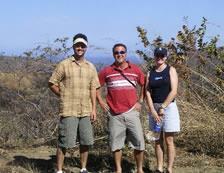 More satisfied clients enjoying themselves here in beautiful Guanacaste, Costa Rica.